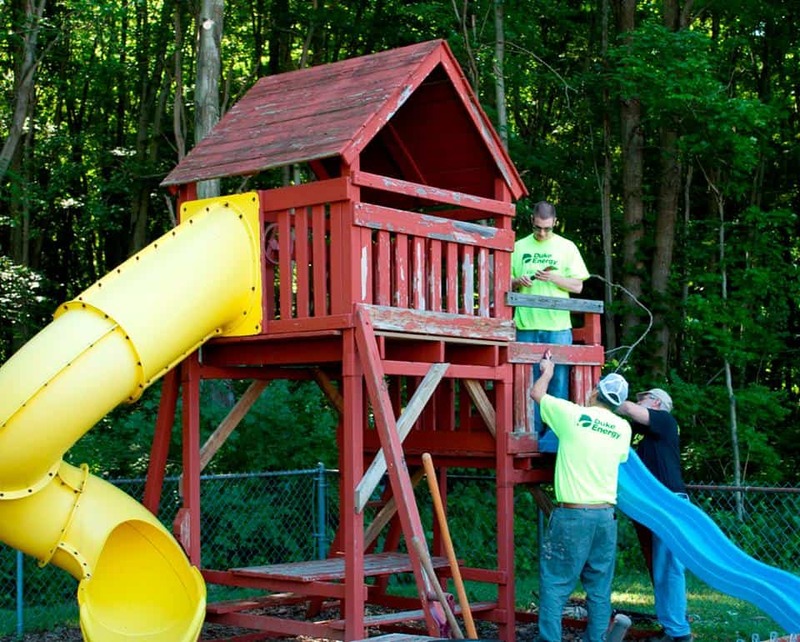 Batavia, OH – Duke Energy donated volunteer time and money earlier this month in Clermont County to improve the playground area and visitation rooms for families of Clermont County Children Services. Warren Walker, Duke Energy Eastern Territory District Manager of Community and Government Relations, led project efforts in coordination with Amanda List, Clermont CASA Executive Director, and Wade Grabowski, Clermont County Director of the Department of Facilities. “It truly motivates me to work with this particular team of planners and volunteers! I applaud both Amanda List and her team for their endless efforts in helping local kids, Clermont County Facilities Department and the group of Duke Energy volunteers for their hardworking dedication,” said Walker. The team made improvements the old playground equipment and general area for the kids and families to enjoy during visitations. The volunteers also provided landscaping to make the play area look nicer and cut back trees to keep the area safe for children. Kevin Schuchter, Vegetation Management Forester for Duke Energy, stated this is one of the best volunteer crews and projects he’s worked on. “It’s our honor to collaborate with this group of volunteers and Lewis Trees to help needy kids, we’re happy to donate our time and resources to make their situation a little less difficult and more enjoyable,” said Schuchter. If you’re interested in joining the cause to support local kids in need, then save the date for another remarkable chance to help our local youth at the Annual Starfish Foundation Golf Outing event! The event will take place on August 5 at Elks Run Golf Course and there will be plenty of chances to contribute. The Starfish Foundation was formed to make a difference in the lives of abused and neglected children involved with Clermont County Children’s Services in the memory of the late John E. McManus and is another way individuals can help our local neglected kids feel valued. Contributions in the past gave many children those extra items that many may take for granted; such as, eye glasses, graduation expenses, summer camp opportunities and local sporting events. The Clermont County Commissioners expressed their gratitude for the donations from Duke Energy volunteers and partnering organizations. “It is great to see Duke Energy and the many volunteers pitching in to make a real difference for the kids of Clermont County. We genuinely thank you,” said President of the Board, Ed Humphrey. For more information about these community efforts or to learn how to help, contact Amanda List at 513-732-7160.